Grilled Asparagus is perfect to accompany your chicken, beef, pork or fish or as part of a wonderful salad. Asparagus is a star vegetable, especially during the Spring. It is a delicious side dish or a wonderful addition to a fresh salad. Asparagus is loaded with nutrients! Squeeze a little fresh lemon on top or when you have Parmesan cheese on hand, grate some over your freshly grilled asparagus as an extra treat. Yummy! One of the good things about this asparagus recipe is that it is simple. This recipe is for a basic method for cooking asparagus. Fresh asparagus with a little oil, salt, and pepper cooked quickly over high heat on the grill. Just be a little careful not to over-cook the asparagus. Preparation time: 5-7 minutes. Serves 6 - 8 depending on portion desired. Note: if you wish, soak some skewers for about 30 minutes in water. Then divide the asparagus into 6-8 bunches and thread 2 skewers crosswise through each bunch (see photo). Then brush asparagus with oil and season with kosher salt and pepper. The skewers make it easier to turn the asparagus. Another Note: Want to serve asparagus but grilling outside is not an option? Asparagus may also be grilled in a well-seasoned ridged grill pan over moderately high heat (see picture). Serve the asparagus immediately after removing from grill. Add a lemon wedge or sprinkle the top of the asparagus with freshly grated Parmesan cheese. Enjoy your asparagus and the company of those you share it with! Did you know? 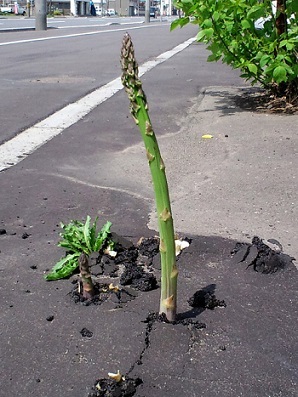 Asparagus is an extremely healthy little plant. It contains quite a bit of calcium, zinc, magnesium, fiber, thiamin, riboflavin, rutin, niacin, folic acid, iron, phosphorus, potassium, copper, manganese, chromium, and selenium. It also contains good amounts of vitamin A, B6, C, E, and K.